With record numbers of salmon and trout recently recorded in British rivers, we celebrate with a guide to some choice spots for game fishing across these fair isles. One of the finest chalk streams in the world, the smooth flowing waters of the Test in Hampshire support a rich and diverse stock of marine life, but it the large wild brown trout roaming its depths that give it its international renown. 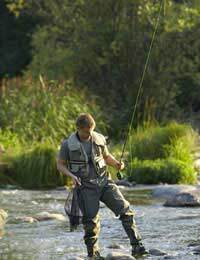 What's more, it is also a rich source of rainbow trout, sea trout, salmon and grayling. Another important game fishing spot is found at the glorious 1,560-acre expanse that is Grafham Water. This Huntingdon locale is credited with sparking the modern day boom of stillwater trout fishing after a first stock of small trout in the 1960s took to the water with great enthusiasm and grew at an extraordinary rate. Another reservoir of similar renown amongst trout anglers is the 700-acre Draycote Water. Regularly stocked with both rainbow and brown trout this reservoir near Rugby is hailed as one of the UK’s greatest dry fly fishing venues, a popularity in part due to the fishes’ fondness for feeding on the surface. One of the southwest’s best salmon and sea trout rivers, the idyllic River Tamar and its tributaries also produce some of the finest wild brown trout and grayling fishing in the southwest region from the start of March to mid October. Now running clear once again after many year of pollution, the rivers of Wales account for more than half the sea trout caught in England and Wales. Flowing easterly direction from its source in the Cambrian Mountains, The Towy is widely regarded as the country’s very best source of sea trout, with the river and its tributaries – including the Cothi and the Gwili - producing an annual average declared catch of over 4,000, with many over 10lbs. Most of the trout are taken on a fly at night when the water is clear. The Towy is also a rich source of salmon with an average of 500 caught each year. Another Welsh river lauded for its game fishing is the River Usk, which flows through the Brecon Beacons. Although it has a generous share of runs of sea trout and salmon, this beautiful waterway is famous across Britain for its wild brown trout fishing. In early season anglers have been known to snag up to 20 and 30 browns a day of mostly 10b apiece. By April/May time the salmon start to stake Usk’s secondary fame as Wales’ best performing salmon fishery. The Tyne is not only the best salmon river in England and Wales – with catches averaging weights in double figures - but also its most prolific sea trout waterway. Once more renowned for its pollution, this Northumbrian river - which starts life as the North and South Tyne before uniting near Hexham – has been reborn in recent years with the annual fish total counted in the system pushing 30,000. The river is literally teeming with heavy fish during September and October. Its tributary the River Derwent is an established brown trout fishery with an improving line in grayling. Winding through the dramatic landscape of the Peak District, the spring fed limestone River Wye has the rare distinction of being one of the few waters in Britain where the rainbow trout are able to breed in the wild. The crystal waters and busy fly culture make the Wye a river that is flourishing with wild life, not only in rainbow trout but also its native brown trout. The shallow, 3,500-acre Loch Leven has been a celebrated trout fishery for well over a century, and its own unique, graceful yet feisty breed of wild brown trout are used to stock fisheries across the globe. Although its native fish populace fell into decline for many years and had to be supplemented with farmed rainbow trout, reports suggest the loch is back to its glory days. One of Scotland’s big four salmon rivers, the Spey stands out from the pack for the size and strength of its stream, which is the greatest of any river in Britain. Besides salmon its waters also throw up a fine sideline in sea trout. The most recommended section is downstream from Grantown, which is where the most famous fly water beats are located. It may be of less renown than many of the waters covered already, but the River Foyle system in North-west Ireland is certainly no way inferior, even laying claim to offering the best salmon fishing in Europe. This prolific grilse and summer salmon water system of around 900 miles produces total annual runs of around 80,000 fish.